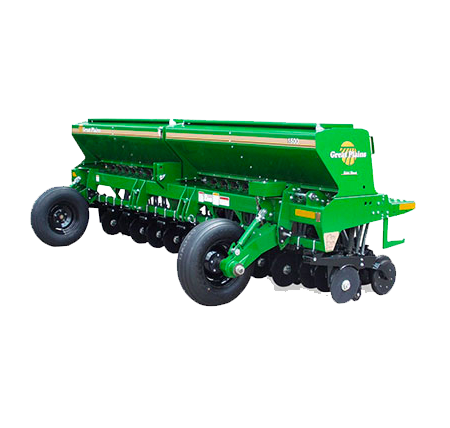 The Center Pivot Hitch (CPH) is designed to turn your basic 3-point drill (1200 & 1500) into a fully featured no-till drill, complete with coulters and adjustable down-pressure. 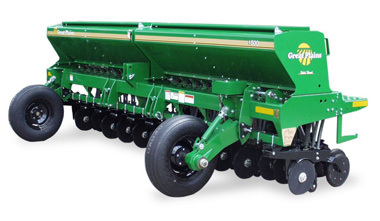 The CPH allows you to choose between having the drill rigid or float independently of the hitch. To increase the coulter depth, simply shorten the tongue cylinder. 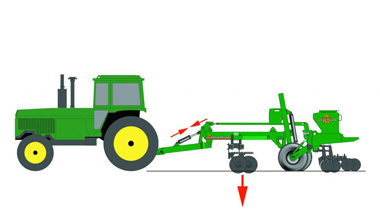 The unique design of CPHs and PFHs transfer weight from the tractor to the coulters to aid in penetration. 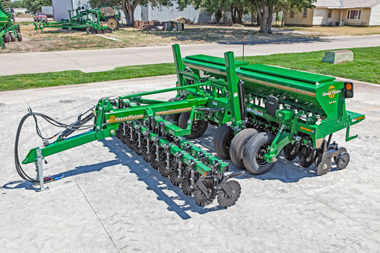 Great Plains is the only no-till system that plants properly on curves and contours. Our CPH (Center Pivot Hitch) and PFH (Precision Fertilizer Hitch) aligns the coulters with the openers for perfect tracking. 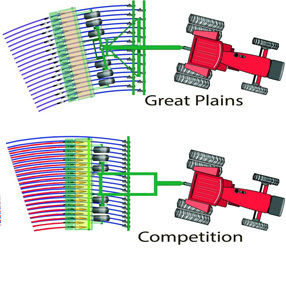 As the illustration demonstrates, competitive brand pivoting coulters cannot maintain proper tracking. 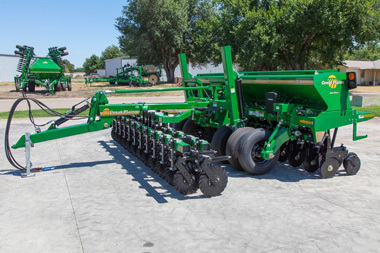 The 1200 & 1500 3-Point Drills are 12′ (3.66m) and 15′ (4.57m) Mounted Min-Till Drills that, when combined with a CPH (Center Pivot Hitch), turns into a formidable no-till machine. 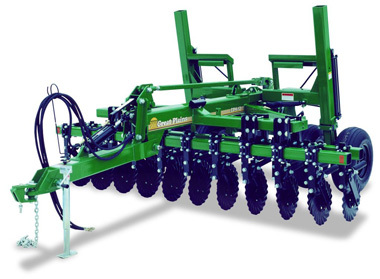 Tyre Size 7.00-15LT 8-ply 9.5Lx15 7.5 x 20, 4-ply Rib Implement 9.5Lx15 9.5L x 15" 9.5L x 15"
Width 9'9" (2.97 m) 12' 11" (3.94 m) 15' 7" (4.74m) 15' 11" (4.85m) 12' 2" 15' 4"
Length (Transport) 12' (3.66 m) 12' 6" (3.81m) 17' 8" 17' 8"
Height (Transport) 5'4" (1.63 m) Varies by Tractor 5' 6" (1.68m) Varies by Tractor 8' 11" 8' 11"
Opener Depth Range 0-3.5" (0-8.89 cm) 0-3.5" (0-8.89 cm) 0-3.5" (0-8.89 cm) 0-3.5" (0-8.89 cm) 0 to 6" 0 to 6"